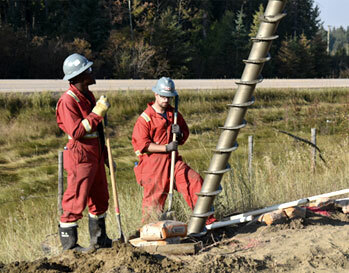 Ketek is one of the most experienced Canadian companies in the science – and art – of dewatering. The intent of dewatering is to lower and control the water table. Dewatering refers to the removal of groundwater from soil so excavators can safely and effectively dig trenches and excavations for pipelines, foundations, shoring and cellars. Dewatering involves the use of pumps in wells drilled deep into the earth or, for shallower excavations, the application of vacuum to wellpoints. Wellpoints are long, thin pipes that can be stuck in the ground and, like a straw, used to lift water from the Earth. 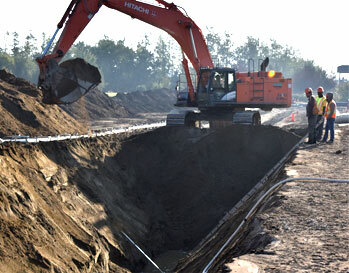 Dewatering will stabilize the slope of an excavation and allow proper compaction of underground facilities. This method uses the same drilling and pumping technologies as water supply wells, but in this case the goal is to remove the groundwater. To create the necessary “cone of depression,” several wells are drilled close to each other and fitted with submersible pumps. Working together, they create a hydraulic gradient and water is drawn to the wells. As pumping continues, the cones of depression expand, lowering the local water table. Deep wells enable excavations to be made safely and effectively and are often required before excavations for pipelines, foundations, shoring and cellars. Deep-well dewatering will stabilize the slope of an excavation and allow proper compaction of underground facilities. The wells are drilled just outside the area of the proposed excavation, every 20 metres or so, depending on the project requirements. Electric submersible pumps with riser pipes attached are lowered into them. 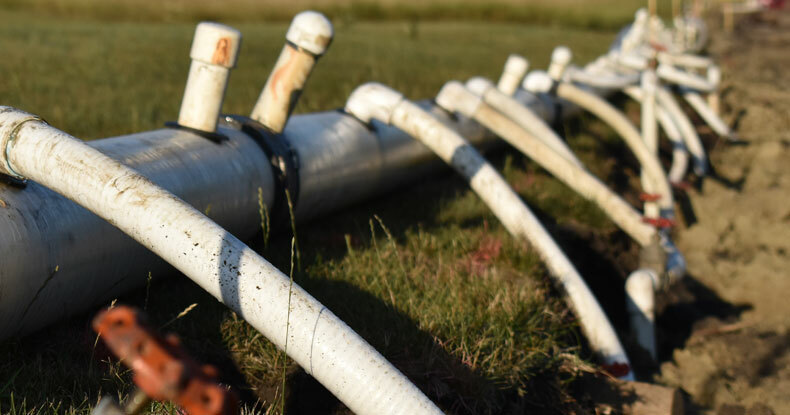 These pumps have small diameters so they can fit down the wells, which are usually between 12 and 35 centimetres in diameter, depending on the flow rate the client needs to achieve. The most common form of pumping is by electric submersible pumps, which are lowered inside a screen so water can flow more freely. Large drawdowns can be achieved, depending on the number and depth of the wells drilled and hydrogeological conditions. Deep well dewatering is normally suited to relatively deep excavations (more than five metres) in soil or rock where permeability is either moderate, like sand, or high, like gravel. 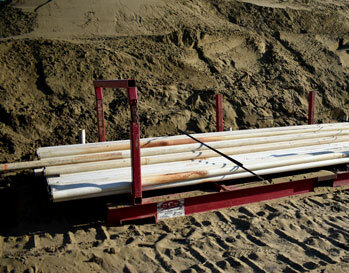 For shallower excavations, wellpoint dewatering may be the way to go. Wellpoints are small diameter, 20-foot-long PVC pipes – think of them as giant straws – with some small slits cut at the bottom of them. They get installed, about 1.5 metres apart, close to the edge of a proposed excavation to remove groundwater. If the water isn’t removed, it’s impossible to dig because you’ll just end up with a big muddy mess. First, holes are drilled in the ground to about 20 feet. The wellpoint is lowered into the hole and then a couple of bags of sand are emptied into the hole to allow groundwater to more easily flow into the small slits in the bottom of the wellpoint. The wellpoints are connected through a series of swing joints and header pipes to a vacuum system. Turn on the vacuum and the wellpoints act like giant straws, sucking the water out of the ground like a kid on a Slurpee. The vacuum strength is limited, so the drawdown ability of a single-stage system is about five metres. Systems can be installed in multiple stages to increase this limitation. Mines must always be aware of water management. Controlling and removing water in a mine, which may run hundreds of metres underground, requires a high level of skill and specialized equipment. Mine dewatering presents some unique challenges in that water volume may be large, the safety of workers is paramount and the integrity of the mine itself is a significant consideration, and water discharged from a mine may not be fit to discharge into the environment. Fortunately, there are solutions to these problems. Ketek has the means to dewater mines properly and responsibly.